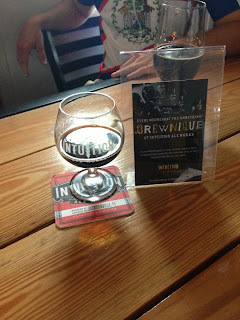 I love the new series Intuition Ale Works has going on at their taproom! Each Wednesday, the brewery is putting out a new and unique small batch brew for patrons to enjoy. Although my work schedule has been nothing short of crazy over the past 8 weeks, I managed to make it out last week. The brewnique offering was a batch of The Eleanor infused with grapefruit and basil. The original Eleanor is a Belgian blonde ale brewed with a variety of teas that is laced with crisp fruit flavors. It's light and refreshing and perfect for the Florida summers. This infused version packed a punch of citrus and exotic flavors. Unlike other infused batches where there is but a slight change in the flavor profile from the original, this version of The Eleanor came with an extreme makeover that would make Ty Pennington proud. If you're in the Jacksonville area, you need to prioritize your schedule to include a stop at Intuition's taproom every Wednesday. For me, it's a great excuse to get out during the week. I particularly enjoy the fact that I'll be able to try something new each time I go.